Boilers don’t come with expiry dates and, as many people find out the hard way, they can often throw in the towel with no warning at all. There are, however, some telltale signs that it may be time to bring in a younger model. All good things come to an end and when a boiler is over 10 years old it may be time to start looking at a replacement. This is true even if the boiler doesn’t seem to have any major faults. Technology has moved on significantly in recent years and the old models just can’t compare to the efficiency levels, safety features and smart control options on the market today. Some boilers just don’t make the grade when it comes to energy efficiency. An A rated boiler has an energy efficiency of 90% of more. To put this in perspective, a G rated boiler has an efficiency of 70% or less which means for every £1 you spend on your heating bill you are wasting 30p on lost energy. Replacing your boiler with a more energy efficient model could save you up to £305* a year on your heating bills. If it seems that every other week there is something wrong with your heating or hot water, or you’re constantly topping up the pressure, things are only set to get worse. The money you are spending on replacement parts, call outs and quick fixes could be much better spent on a replacement boiler that you can rely on. Boiler Guide can help you to get quotes from up to 3 qualified heating engineers in your area. Don’t worry — there’s absolutely no obligation and no fee. While it’s worth considering switching energy suppliers to combat rising bills, it’s also possible that your boiler is the culprit. An increasingly inefficient boiler costs money most of us just can’t afford to spare. In addition, upgrading to modern day smart controls gives you greater control of your energy use and spending than ever before. Maybe you’ve grown use to them, but the banging, gurgling and kettling noises coming from your boiler are not happy noises. They signal that something is wrong and, if ignored, can lead to damage and breakdown over time. A healthy boiler should burn merrily with a blue flame; if your boiler’s flame is yellow it could be a sign of carbon monoxide problem which is a serious issue. It’s a dangerous, odourless and colourless gas that can be fatal if exposure levels are high enough. Symptoms of carbon monoxide poisoning include dizziness, nausea, headaches and fatigue. If you suspect that fumes containing carbon monoxide are escaping from your boiler, call the free Gas Emergency Services emergency line immediately on 0800 111 999. Although carbon monoxide is odourless, gas companies do add a scent to help you to identify when there is a leak. If you smell the eggy, sulphur smell of gas you need to open windows and vacate the premises as soon as possible and before contact the Gas Emergency Services on 0800 111 999. Unusual smells can also point to other faults in the boiler e.g. a metallic, electrical burning smell or even a smell like burning fabric. You need to contact an engineer to investigate the problem. If your boiler engineer tells you that parts are hard to find, it’s a very clear warning sign that the boiler’s days are numbered. Hard to face, we know, but you can’t avoid it forever! We can help you to get quotes from up to 3 qualified heating engineers in your area. Don’t worry — there’s absolutely no obligation and no fee. A water leak from your boiler could cause significant damage both to your home and other parts of the boiler. It’s important that you contact an engineer as soon as possible before things escalate and become dangerous. 10. It Just Doesn’t Get The Job Done! Sounds simple, but it’s amazing how long we will put up with a system that just doesn’t work very well! If your heating takes ages to kick into action or the house is never quite warm enough, or you’re always running out of hot water it’s time to call an engineer to investigate. 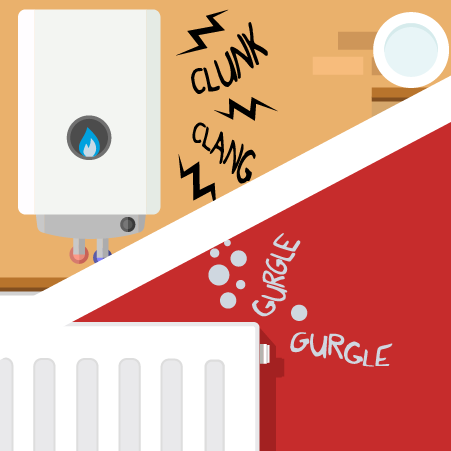 If any of these problems sound familiar, it could be time to replace your boiler. The first step is to get in touch with local boiler engineers. They will be able to assess the entire heating system and give you the advice you need to get things sorted. To make things easier, Boiler Guide can provide you with free, no-obligation quotes from up to 3 engineers in your area so you can compare quotes and choose the best one for you. Figures based on installing a new A-rated condensing boiler with a programmer, room thermostat and thermostatic radiator controls (TRVs) in a gas-heated home from an older boiler with a programmer and room thermostat. Based on fuel prices as of April 2018 for a detached house.